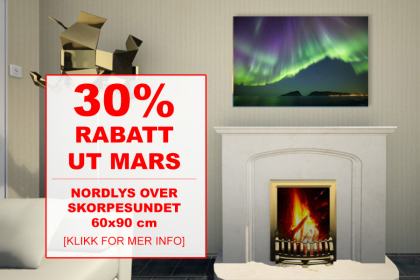 Out in March 2015 we run a promotional price of photo Northern lights over crust Sound on 30% off the regular price. Size 60×90 cm on the foam plate. Click here for more information about pressure on the foam plate. Regular price £ 2890,- ink, mva Offers Price kr 2025,- tax incl. Campaign period has expired. Click on the image below for more information.